Hello, dear reader, and welcome back to the Balboa Victory Dental Office Blog! More than anything, we want to make sure that Encino area residents have as much information as possible about ways to improve their oral health. Good oral hygiene is not only essential for healthy teeth and gums, but is also essential for total body health. One of the best ways to make sure that your mouth is as healthy as possible is to make sure that there is not an excessive amount of harmful bacteria in the mouth. While this is usually accomplished by brushing, flossing, and general components of an oral hygiene regimen, there are other ways to make sure your mouth does not become overrun with bacteria. In today’s post, we are going to cover Xylitol, a substance that dentists recommend for its ability to positively affect the oral health of individuals. Continue reading below to learn more. Before we being, we felt it would be a good idea to explain exactly what Xylitol is. Xylitol is a sweetener made from a sugar alcohol compound. While the name may be a little misleading, there is no sugar or alcohol in this sweetener and instead, it gets its sweetening power from carbohydrates that mimic the taste of sugar. These carbohydrates can occur naturally in plants but, for the most part, they are manufactured from sugar and starches. Although commonly referred to as one, Xylitol is not an artificial sweetener but is instead a crystalline carbohydrate that looks very similar to sugar. While we can naturally consume Xylitol from fibrous plants, berry-type fruits such as strawberries and raspberries, and vegetables, we cannot eat enough of these foods to obtain enough Xylitol to cause any noticeable dental benefits. How Does Xylitol Help Teeth? Xylitol helps to create a healthier mouth in two distinct ways. First, consuming Xylitol during the day can help to keep a neutral pH level in the mouth. A neutral pH means that the teeth are less likely to become damaged from acid produced by mouth bacteria. Acid, as most people know, is horrible for the mouth and works to strip the enamel from teeth. Second, Xylitol makes it more difficult for bacteria to stick to teeth, further reducing the amount of active bacteria in the mouth. Together, these two benefits work to create an environment in the mouth that is inhospitable to bacteria, greatly reducing the frequency of tooth decay and gum disease. We hope that this blog has been informative and that you have learned a little more about the effects of Xylitol on the mouth. While this substance does not replace regular brushing and flossing, it can help to fight bad bacteria in the mouth and keep your smile looking fresh. 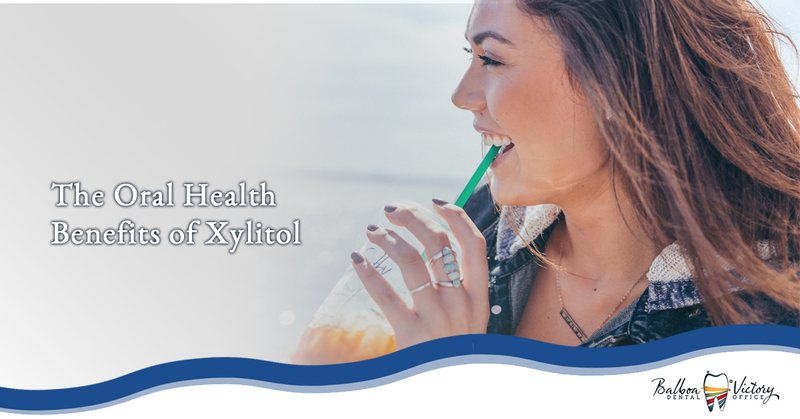 If you would like to learn more about Xylitol or you would like to schedule an appointment at our Dental Office in Encino, please contact us today. At Balboa Victory Dental Office, we will help you make sure that your oral health is as good as possible.